You’ll find Heythrop Park in the charming Cotswolds, close to the market town of Chipping Norton and a mere fifteen miles to the north of bustling Oxford. At the centre of the 440-acre Heythrop Park Estate stands a grand Baroque-styled country house that was restored and converted into a luxury hotel and country club by businessman and former owner of Oxford United Football Club, Firoz Kassam. Tom Mackenzie, of Mackenzie & Ebert Ltd, designed Heythrop Park, which opened for play in October 2009 and it’s routed through the leafy grounds of the stately Heythrop Estate. With five sets of tees which stretch out to an impressive 7,156 yards from the tips, Heythrop Park is a course that will challenge the best while remaining enjoyably playable for the higher handicapper. USGA standard greens provide all-year-round consistency, and, with water coming into play on no fewer than eight holes, Heythrop Park will provide for an exciting and at times rather exacting day’s golf. Heythrop Park Golf Club membership will be limited to 400 and the club are currently offering exclusive VIP tours of the golf course and the Health Club. If any one of the Top 100 team lived close by, we’d love to be part of one of the century’s most exciting English golf developments. Finally, we’d like to mention “The Heythrop Challenge”. Archer Bridge is the name of Heythrop’s risk and reward 6th hole. Naturally, with “Bridge” in the name, water is the predominant feature. 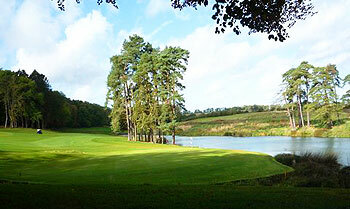 The Heythrop Challenge is to drive the green, 277 yards from the tee. You’ll have to carry the lake and stop the ball on the green. If you are successful, they will waive your joining fee for membership. Will you take it on? This course has some potential with some testing risk reward holes but the course is so poorly maintained that it would take an epic effort to get me to return. The greens were so slow they were almost unplayable, a lot of areas required seeding and general TLC and the bunkers were all inconsistent. Holes 5 and 6 are enjoyable but the finishing 3 holes are a let down. Hotel is good and food was ok. If they spent some money on the course it could reach a birdie rating. Responding to the last few reviews, you can play Frilford Heath all day for £40 on county card and Tadmarton Heath for less, Heythrop is a good days in the summer, but it struggles at other times, in between autumn and spring Heath and links is it, you can play all day for £12 on county card at the Channel course Burnham and Berrow,£20 without, best value in the world. Stayed and played here recently for a 1 night break - big mistake.The golf experience is pretty awful from start to finish. When you arrive you have to park in the middle of a muddy field - the only hard standing car park is reserved for the poor members. Refreshment in the club house was extremely limited and very expensive. They had no scorecards - we had to make do with a photocopy. Then you make your way to the course. The first 3 holes are a pretty good example of what is to come - essentially lots of bland, featureless holes on a very poorly maintained track. Tees were covered in moss, fairways not well maintained, what bunkers there were in poor state etc. The greens were Ok apart from the multitude of pitch marks that had been left unrepaired. there are a few nice holes - 5, 6 and 13 come to mind but beyond that all very unforgettable. Eventually you arrive at the 18th which has the claim of being one of the straightest holes in golf - it is also probably the most boring! Around 600 yards of arrow straight, very wide fairway, not a single bunker and a flat green at the end - very dull. The hotel was good enough, and the food was also OK, but we won't be returning. Possibly the dullest golf course I have ever played. Played here a few days ago and wasn’t impressed, although this is partly influenced by the fact that the society I was with were on course for 5 hours but only managed to complete 16 holes. All due the society we were following paying 2-ball Texas scramble - can only assume it was their decision to do this, as if the club/course allowed this then I’d be even more disappointed. After 7/8 holes our organiser tried to contact the ‘pro-shop’ (and I use the term lightly) to speed things up, but when someone eventually answered was told they couldn’t send anyone out to marshall the slow pace, as there was only her & the barman available!As for the course itself, the holes were good, largely speaking, but the overall layout is very poor. There’s simply too far to travel between most of the holes, and in some instances the pathways from tee to fairway add considerable distance – buggies are almost a necessity.Additionally, the greens were being treated (obviously these things have to be done) which made putting a lottery.On the plus side, the food was good and there was plenty of it, but I can’t help feeling that it’s a hotel /country club with a golf course attached as an afterthought.And I’ll agree with some of the other reviewers, how it was ever ranked as the second best course in Oxfordshire is beyond me.In summary, if there’s no-one in front of me, and the greens aren’t being treated, and I’ve got a buggy then I might, just might, go back – but it won’t be soon. This is a true test of golf in every sense. It is a distinct advantage to be able to carry the ball 200 yards of the tee shot. You will be able to use every club in the bag when it comes to approach shots, and once on the green a two putt is certainly no given, as the large undulating greens which roll fast and true are a game in themselves. A fantastic 18 holes of golf with risk and reward holes, positional tee shots and breathtaking scenery, a must play if you visit Oxfordshire. The course descriptions may have been relevant at the time of writing or when the course was redesigned in 2009 but the current course bears no resemblance to some of the review now. Played the course at the end of June with 16 members as a society package bacon bap on arrival, 27 holes of golf light lunch and evening meal. The course was in poor condition, greens left a lot to be desired,edge of the bunkers uncut, inconsistant sand, tee off areas were flat but not a blade of grass. The shared club house and spa area had no means of dealing with 16 society members for light lunch or for an evening meal, we had to serve ourselves, request cutlery, condements and we're all sat seperately some even had to eat the food on their laps As a well established society we've played over 70 courses within an hours drive of Swindon this is the worse society day out we've ever had. Definitely not one of Oxfordshire's best courses and definitely not a course for a society. Over rated, over priced, we'll not be going back. Played Heythrop last week, and was very impressed. We had 'Millionaires Golf', an empty course on a Monday morning, possibly the best value course I've played. A gentle start, as long as you are accurate, leads beautifully to a middle 3rd of holes that are hard to beat. 5, 6, 7 and 8 being the real pick, fantastic design using the natural elements of trees, water and contours, all have a Wow Factor. 10 and 11 are also very strong. I don't consider there to be a weak hole on the course. Go and try it, the condition was very good, greens challenging if a little slow. Deserving of it's ranking, I will be back very soon for a return visit. I have played Heythrop many times since it opened a few years ago, it is an OK track that is often in good condition and with nice greens.However there is no way this should rank 2nd in Oxfordshire. A year after my first visit to Heythrop Park I returned to find a course that is slowly maturing into a quality venue. Due to the history of the Heythrop Estate certain restrictions were placed on designer Tom Mackenzie’s work. This meant that much replanting was required to reproduce the original parkland layout and some areas could not be changed in any way. Inevitably this created issues when it came to the routing of the course and there are a couple of brisk walks between greens and the next tee, but overall I think the design has character and variety. Before taking on the first tee shot I would recommend spending a few minutes warming up on the excellent practice area. The main reason for this being the Jesuits graveyard on the left of the first fairway which combined with mature beech trees on the right puts you under pressure right from the off. The next memorable hole for me is the 4th, a good par 5 with three bunkers set at an angle across the fairway waiting to catch the misjudged second shot. An attractive stone wall runs along the right hand side for the full length of the hole. The fifth is a lovely hole, dog-legging right across a water filled valley, you must decide how much to bite off. A well struck shot on the tiger line may well challenge the green and set up a good birdie chance whereas the poorly struck ball could well be lost. The 6th is a real beauty and my favourite hole on the course. Hitting from on high again over water to a fairway running across you, you must choose your line carefully. The green nestles on the waters edge protected by an attractive stand of pine trees and with the grand old bridge situated behind this is one of the prettiest spots on the course. The 8th is a strong hole, dog-legging right and uphill; it requires two well struck shots to get home and the 9th is a pretty par three protected by water all the way up the right side of the hole. The 11th is an unusual downhill par 5 which is unique in my experience. The safe option is to get as close as you can to the old skating lake in two before hitting your third over to the green which is tucked away to the left in woodland. Looking back up the fairway you get a wonderful view of the majestic old Hall. This is a tough but good looking hole and another of my favourites. The 13th is a picturesque par 3 running downhill to a green set beyond a small water feature and the 14th is a cracking par 5, initially uphill over a wall, it bends left all the way before leaving you a downhill shot to an attractively positioned green. The finishing hole is a poker straight par 5 heading straight for the main entrance of the Hall. There are no bunkers but the green is guarded by a series of grassy mounds and hollows. A really wonderful course. Played on a sunny day and the beauty of the area was captivating. It has been really well designed into the existing landscape and is a true championship course (an overused term in my opinion but not here). Some really great great holes - 5, 6, 8, 9, 11, 13, 14 are the best in my opinion. Played it off the blacks and it is a monster, but very fair. True that it is a long hike so would definitely recommend buggies for anyone that is worried by that. It was in good condition considering the winter we have had and I think it must only be a matter of time before it makes a strong top 100 GB&I placing. Staff knowledgable and a very relaxed atmosphere in the clubhouse. I would highly recommend this venue to any keen golfer as a must play.